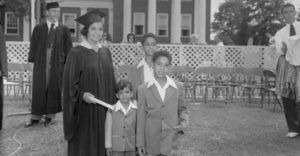 University of Maryland School of Law graduate Juanita Jackson Mitchell in cap and gown with her sons Clarence M. Mitchell III, Keiffer Mitchell, and Michael Bowen Mitchell. College Park, Maryland./Photo By Paul Henderson, circa 1950. Maryland Historical Society, HEN.00.B1-043. Mitchell founded the Baltimore City-Wide Young People’s Forum in 1931 and the NAACP Youth Movement in 1935. In 1942, she directed a march on Maryland’s Capitol with 2,000 citizens, as well as the first city-wide “Register and Vote” campaign. The campaign resulted in 11,000 new voter registrations on the books. She was appointed to Presidential Commissions by Presidents Franklin D. Roosevelt, John F. Kennedy, and Lyndon B. Johnson.